Hey yall, be sure to lock your gear up good. I woke up this morning to find my four wheeler was stolen. Anyone in the Halifax/Northapmton co area that runs into someone trying to unload a 2008 camo Kawasaki Brute Force in a hurry, please shoot me a pm. Thanks and hope it doesn't happen to yall. Sorry it has been a while since I logged in. About 3 weeks ago, I got a call from the Greensville Co Sheriff's dept in Emporia VA. They had arrested a guy with a ton of stolen property. They said he had a quad that think was mine. I made the trip up and dang if it wasn't mine. I showed the Sheriff proof of ownership and loaded it up to bring it home. I had to do a good bit of work to it, rear oil seal change, new cv boot on the front axil, changed the oil (3 times to get all the water out) and changed the differential oils. He had take the saying 'drive it like you stole it' literally. It was a lot of work but at least I got it back. As for the man who stole it, he is facing a few years in bubba's love shack for all the equipment he had stolen from around the region. A comment titled: Good Looking Boat in response to a report titled: Taking this Duck hunting thing to the Extreme? Great job on that boat. Its not extreme by any means. 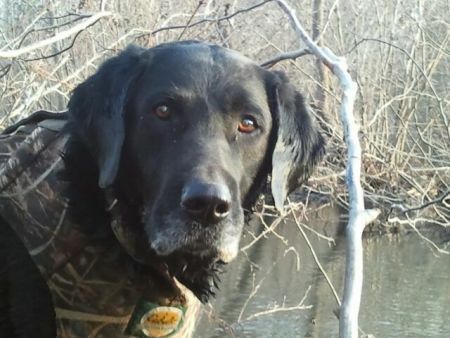 If you need other ideas for the blind, check out the boats on a couple of duck hunting forums. www.duckhuntingchat.com is one of the sites that I frequent. Becareful though, duck hunting is addictive, and as you are finding out - Expensive. Shoot em if you can. Nice pics. Looks Like you are set up for a good season. I enjoy hunting fishing and sharing the great outdoors with my family.